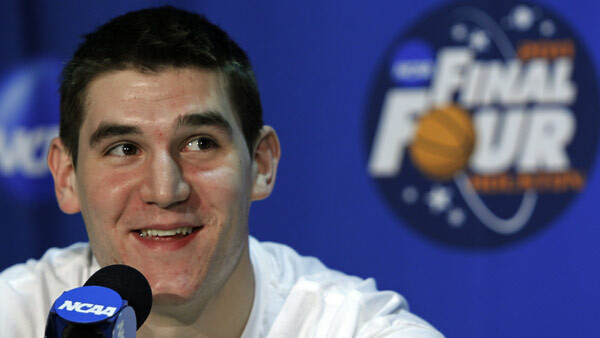 INDIANAPOLIS -- Former Butler big man Andrew Smith, a key player on Brad Stevens' two teams that went to the national title game, died on Thursday after a lengthy battle with cancer. He was 25. His wife, Samantha, confirmed his passing via Twitter on Tuesday afternoon. Butler also released a statement. The 6-foot-11 Smith was a freshman reserve on the 2010 team, and started as a sophomore on the 2011 squad and averaged 8.5 points and 5.6 rebounds per game. Smith scored five points and grabbed nine rebounds in the loss to UConn in the title game. He spent two more seasons at Butler, and then played professionally in Lithuania. He returned home to Indiana in 2013 and was diagnosed with non-Hodgkin lymphoma in January 2014. Smith appeared to be improving and went to work for a local company, Mina Leasing and Financial Services. However, just a few days into his new job, on July 31, 2014, he went into cardiac arrest and spent three days in a coma. Smith had a bone marrow transplant in November and on Dec. 7, Samantha Smith wrote that the transplant had failed and the lymphoma had turned into leukemia. Smith did recently attend Butler's Dec. 19 game in Indianapolis where the Bulldogs defeated Purdue. Smith's former college coach, Stevens, did not coach the Boston Celtics game last Thursday in Chicago and instead went to visit Smith in the hospital in Indianapolis. Smith starred at Covenant Christian in Indiana, but wasn't heavily recruited. He left Butler as one of three players in school history to score more than 1,000 points and also win more than 100 games. "The Butler community is profoundly sad today with the news of Andrew's passing," the school said in a statement. "We saw the way Andrew fought on the basketball court and we saw the way he fought for his health. In both cases, we saw the best of Andrew Smith. But that's what we always saw from Andrew. He gave his all, all the time. As an Academic All-American, he represented the best of Butler in the classroom and on the court. Above all else, what made Andrew special was the way that he genuinely cared for others. Within his large frame was an even larger heart. He is, was, and always will be a Bulldog. The Butler community is proud to have been part of his life, and our thoughts are with his wife, Samantha; his parents, Debbie and Curt; and the rest of his family."